Get started building apps for Windows 8 with 30 to Launch! Take your app from to in-store with tips and tricks sent to your inbox. Sign up here! This first set of colors is from the tiles found on the Start Screen, such as Mail, Calendar, Store, Video, Music and Messaging. With these tiles there is a gradient from left to right that is dark to light for both sizes of tiles. The colors listed are for the wide tile except for Sky Blue since SkyDrive only has the smaller tile. Color 4 I included because it seemed like a large part of the screen…so yeah. This set goes through all these colors. I didn’t do the grey since I only wanted the color HEX codes! Previous Post Get Started with Windows 8 Today! This was awesome!! Found it from StackOverFlow. Thank you very much! Very useful. 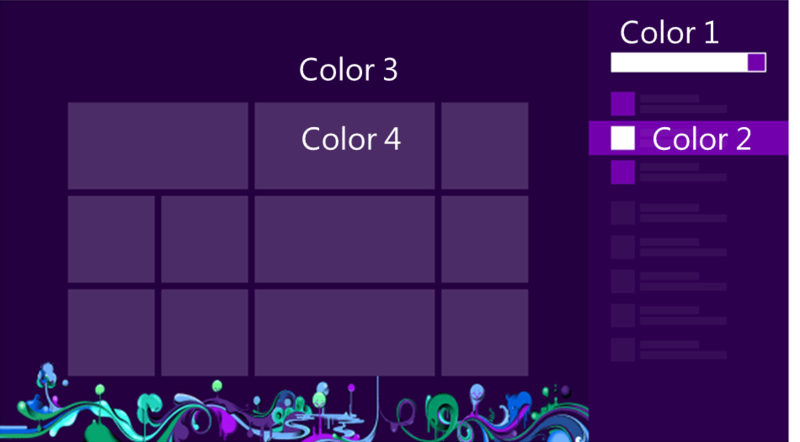 Used your data to create myself a Windows 8 like color picker, thank you! Awesome! If it’s public, send me a link and I’ll blog about it! This is very essential to me!!! Thank you so much for writing about this. I will recommend anyone who needs to get those hex codes to read this blog. Btw, would you mind adding RGB codes for each color? I guess that might be useful in the future. Do you know if Windows 8 theme color that user configured can be retrieved via API? This would be needed to set the Settings panel color to be consistent which the Settings Permissions panel color. There isn’t an API to do that. You can provide a number of color combinations (based on Windows 8 colors) that a user can choose from in the Settings panel though. I hope that helps! Anybody knows the RGB value of the blue Windows 8 login screen? Looking for help. I’m color blind and would really like to know in “Color and Appearance”… Where we can choose from Color 1 through Color 15. What color goes with what number. I mean I know Color 4 is Yellow and Color 15 is White, but after that I’m kind of lost. Kind of frustrates me that MS couldn’t say “blue” or “purple” instead of Color #. Hey very useful information thanks for shared it. WOW this helped me very mush , thank you , may god bless you . good work.. thank you very much… this helped me very much..
Been looking for this, thanx alot man! I would like to copy the Hex Code of the color of his eyes and the brightness of your smile, but I could not. You are beautiful! can win 8 start screen have a white interface??? Thank you for finding that out. It’s a big help here. Just what I was looking for, thanks a real lot! Exlent.. for sharing more power to microsoft thank you.. Better than any other site on hex color codes. Very specific. There are several Metro UI colors and color combinations and we decided to create a list of the most popular ones used in design. This resource also includes various color codes for use in any application, website or even text document. Thank you for sharing these colours. I was looking through out the blogs for these colours but found your blog post after a hard struggle thanks for sharing.